Every day chemists enter their laboratories, intent on making or studying something. For me, my daily task is to think about nanoparticles. At the end of the day the thinking process is no different than a chef working in the kitchen. Small changes in your recipe can make a huge difference. The ingredients, types, amounts, and manners in which they are combined—they all matter. Even when using the exact same ingredients, the slight differences in processing can produce drastically different results! Much like a good chef, a good scientist must be able to control these differences, and make the right observations to troubleshoot problems when things go wrong. At first you may ask, “If I buy my bread from the bakery, can’t you just buy your nanoparticles from the nanoparticle store?” Not exactly. The reasoning isn’t that different from why homemade food tends to taste better than the stuff that is pre-made. 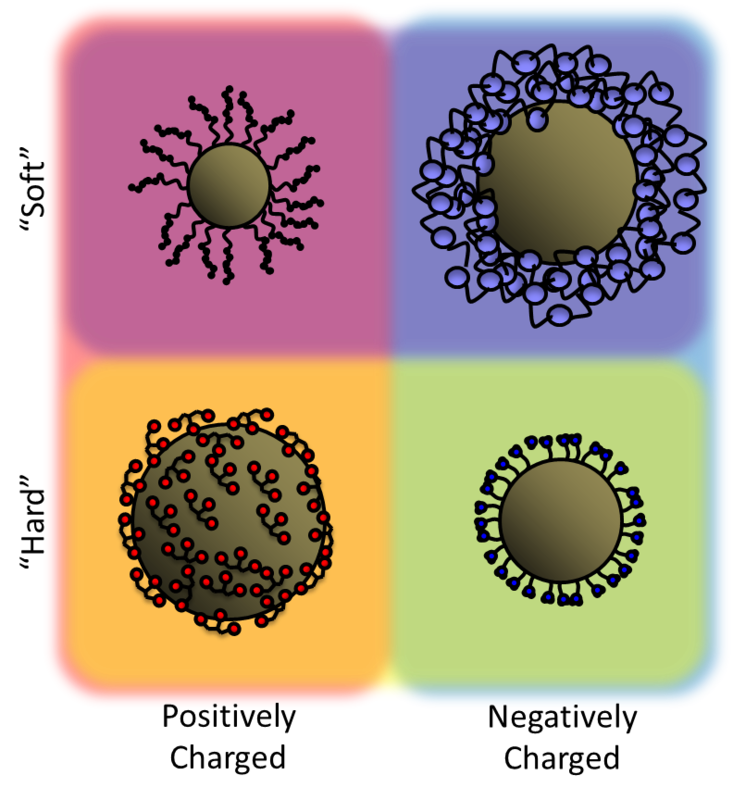 Often, we want to study how specific parameters of a particular nanoparticle (such as charge, size, or shape) affect its overall properties. For example, if we want to determine what happens when we vary the size of a nanoparticle, we need to make sure size is the only property we are varying (and not something else in addition, like surface coating type). This is a tall-order for commercial manufacturers. Imagine trying to order 5 circular cakes that differed only in their radius. Good luck! You would have to bake these cakes yourself, just like we have to make the particles ourselves. Particles can be different sizes; have coatings that are positive or negative; those coatings might be soft and cushy or firm. Controlling each characteristic independently is quite a task! So how do nanoparticle scientists do this? A baker can vary the radius of their cakes by using different sized cake pans, but nanoparticles are too small to even see. For us, one trick is to dissolve our chemical ingredients in different liquids and another is to let them “simmer” in the reaction flask for longer times. This is the way we create “nano” baking tins. Structurally, each is completely different. However, from a percentage standpoint each consists of essentially the same things: water and flour. Almost always there is also something to give some lift, often yeast or baking powder (called a leavening agent). Additionally, there is usually something to add a little extra flavor, but these are secondary to the two main components. The differences between types of bread all come down to gluten, and whether you want to make it (or not!). When bakers combine water and flour together and knead them, a molecular-level rearrangement occurs. 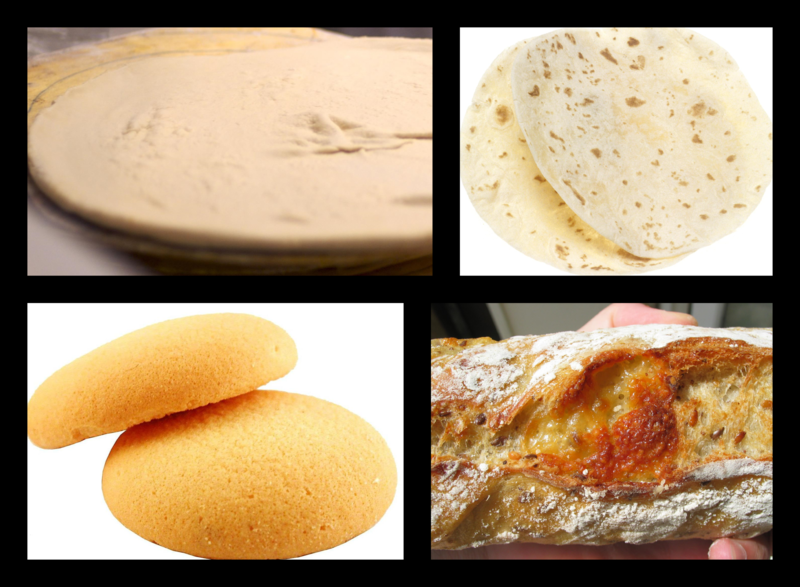 Prior to kneading, two main protein types present in flour, gliaden and glutanin, remain separate on a molecular level. However, upon kneading, these proteins form an intricate network called gluten. This network gives structural form to the bread. The ability for these proteins to get together and make gluten is assisted by water. On the flip side, it is hindered by oils and fats (think of how oil and water prefer to be separate). Kneading physically moves the dough around and forces proteins together to actually make the gluten network. A cook can simply vary the amount of water, oil, and kneading time to control what the product will look like. Making pizza? Start with a pretty large amount of water, minimal oil, and a LOT of kneading. This combination results in maximum gluten formation. To pull dough as thin as a pizza without breaking, there must be a very strong gluten network. Now consider the cookie, which is usually quite crumbly and doesn’t rise very much. This is all due to the butter! Butter is an oil and disrupts the formation of the gluten network. In between the two, bread hits the sweet spot, having just enough gluten to be neither too brittle nor too chewy. The network is tight enough to trap the yeast’s CO2 allowing it to rise, but not so tight that it is free to expand. If your cookies or bread didn’t turn out quite right, you can start to troubleshoot knowing just these basics. Chemical synthesis works in exactly the same way. Very recently when a reaction wasn’t working appropriately, I sat down and approached the problem just as I would have with a batch of biscuits that turned out too dense; what is the purpose of each ingredient and what did I observe? From there, I was able to decrease the amount of one ingredient and make the product I wanted. In my case, a reaction to produce titanium dioxide nanoparticles had simply stopped working as it used to. I knew that one ingredient (in this case, lab-grade ethanol) was critical in the first step of the reaction, but could potentially slow the critical final step of the reaction. I guessed that I had been adding too much ethanol and decreasing the amount would speed this second step up. And it must have, because the reaction with my modified “recipe” is working now! The best way to get good at this type of skill is to practice! Here is a great experiment about the formation of gluten from water and flour, as a function of the type of flour used. Protein content in flour is just another subtle way to tweak the final result. What is Color and How Can It Help Kill Cancer Cells?